The manuscript is interesting not only because of interpolations pertaining to the city of Haarlem, but also because it represents an early version of the Historien van Hollant text printed by Gerard Leeu in 1478. In 1478, the printer Gerard Leeu from the town of Gouda published a chronicle which was known as the Historien van Hollant. These Historien, a history of the counts of Holland, included an extensive account on the origins of the county. It seems to have been a popular work, as is testified both by Leeu’s printed edition and by the large number of manuscripts. Moreover, these manuscripts demonstrate that the chronicle has been adapted and extended several times. The chronicle, which is currently known as the Little Gouda chronicle, has had a major influence on the early modern historiography of Holland. Many stories have been incorporated — via the Latin translation by Johannes a Leydis — in the influential Divisiekroniek, printed in 1517. According to the colophon on the last page, the Leiden manuscript (BPL 136 D) was completed on 17 December 1463. It was written by a scribe called Stephanus filius Heynrici (Steffen Hendrikszoon), who is also mentioned as the (first) owner. Steffen was a patrician from Haarlem. Between 1473 and 1509 he was member of the town’s government several times. His Haarlem background becomes clear from his interpolations in the original text. The most important of these is an account of the Haarlem participation in the Fifth Crusade. The people of Haarlem had played a decisive role in the capture of the Egyptian town of Damietta (1219). As a sign of his gratitude, the Emperor was said to have granted the town a new coat of arms, which is described and depicted in the manuscript. The manuscript is interesting not only because of these interpolations, but also because it represents an early version of the Historien van Hollant text. 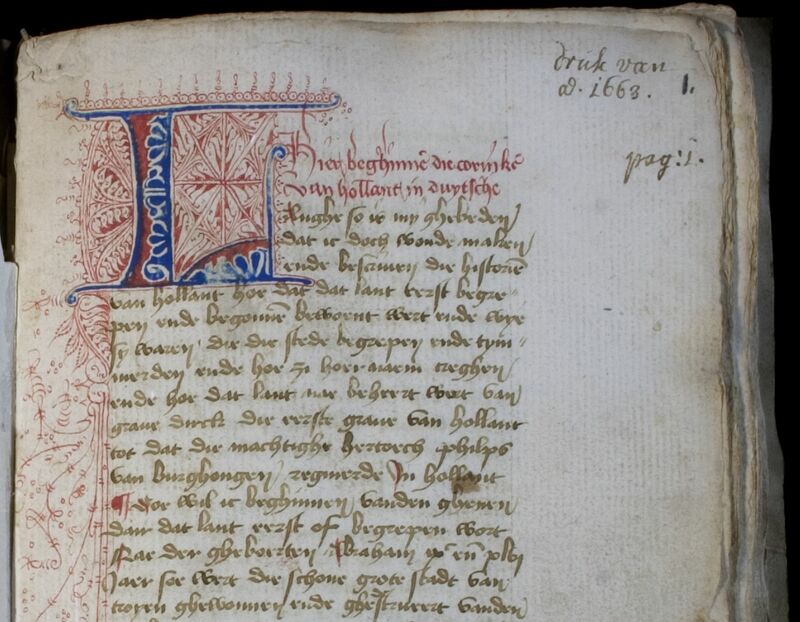 Therefore, the manuscript plays a central role in the edition project on which Antheun Janse is currently working. In relation to this editorial project a complete digital facsimile of the manuscript has recently been published in Leiden's Digital Collections. Blog post by Antheun Janse, Lecturer at the Institute for History of Leiden University.